Want to add visual and literal sizzle to your garden this year? Include hot peppers. These popular plants have become staples in many vegetable gardens because, even with heat levels that, in some, seem to approach thermo-nuclear, it can’t be denied that hot peppers will certainly spice up dull meals at dinnertime. But with such a diversity of shapes, sizes and especially colours, it seems a shame to confine hot peppers to just the veggie patch. Not only are many of these peppers very ornamental, but their colourful fruits are abundant as well as persistent. This means they are ideal plants to add extra eye-appeal to just about any garden setting. In addition, the usual compact size of these annuals makes them excellent companion plants for flower borders and prime candidates for container gardens. 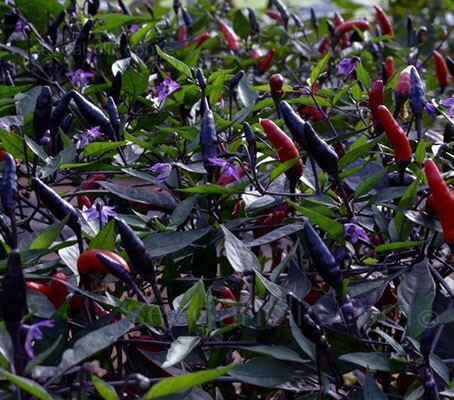 'Zimbabwe Black' is a spectacular edible, but also a very ornamental pepper with unique purple foliage and purple flowers. This dual purpose cultivar, produces masses of edible mild chillies on highly ornamental plants. 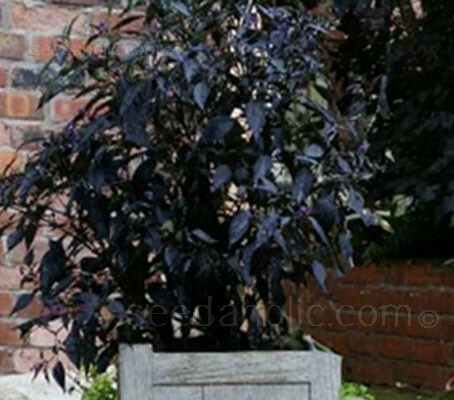 Suitable for Northern European cultivation, the purple stained foliage and colourful chillies which ripen from dark purple to bright red give Zimbabwe Black a striking appearance. 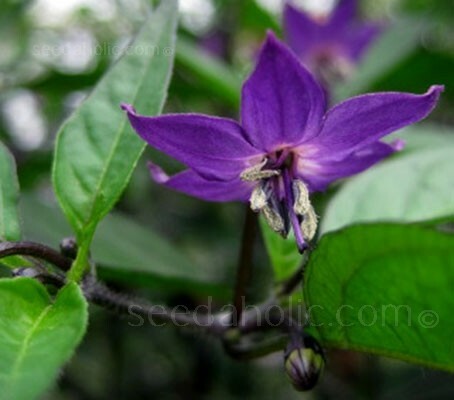 This is a Capsicum annuum cultivar with a densely branched growth habit producing masses of colourful flowers and fruit. The upright plants have a striking tiered habit, purple leaves, purple flowers and dark purple unripe chillies which mature to bright red. 100 days to harvest. The mild to medium peppers are used in southern Africa to make a savory sauce for use as a dip for the staple maize porridge. The chillies also dry well, being thin walled. Remember that if hot peppers are to be interplanted with standard ornamentals, and you are also going to use them in the kitchen, be sure not to spray the fruits with any pesticides that haven’t been approved for use with vegetables.